Authorities from the Qianxinan Bouyei and Miao autonomous prefecture hosted a promotional meeting in Lanzhou, Gansu province, on April 23 to attract more visitors to enjoy the autonomous prefecture’s landscape and culture. With a new airline route from Xingyi, capital city of the Qianxinan Bouyei and Miao autonomous prefecture, to open soon, the two regions have decided to take further steps in tourism cooperation at the meeting with the release of a series of special offers for visitors to Qianxinan. 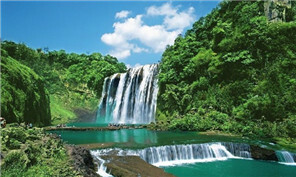 Located in southwestern Guizhou province, Qianxinan boasts a rich mountainous landscape and unique ethnic cultures.